Associated with a small risk of sudden cardiac death. 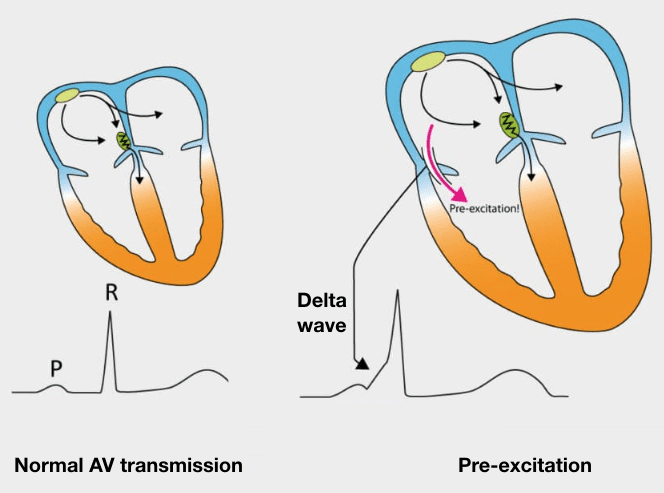 Pre-excitation refers to early activation of the ventricles due to impulses bypassing the AV node via an accessory pathway. 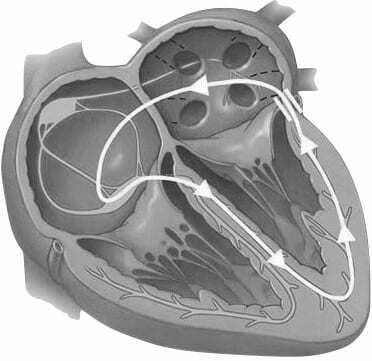 An accessory pathway can conduct impulses either anterograde, towards the ventricle, retrograde, away from the ventricle, or in both directions. In WPW the accessory pathway is often referred to as the Bundle of Kent, or atrioventricular bypass tract. The majority of pathways allow conduction in both directions, with retrograde only conduction occurring in 15% of cases, and anterograde only conduction rarely seen. The direction of conduction affects the appearance of the ECG in sinus rhythm and during tachyarrhythmias. Tachyarrythmia can be facilitated by the formation of a reentry circuit involving the accessory pathway, termed atrioventricular reentry tachycardias (AVRT). 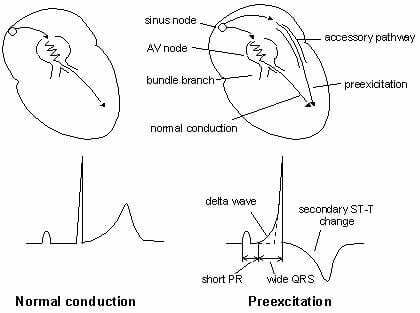 The presence of a pre-excitation pathway results in a number of changes to the ECG in sinus rhythm. 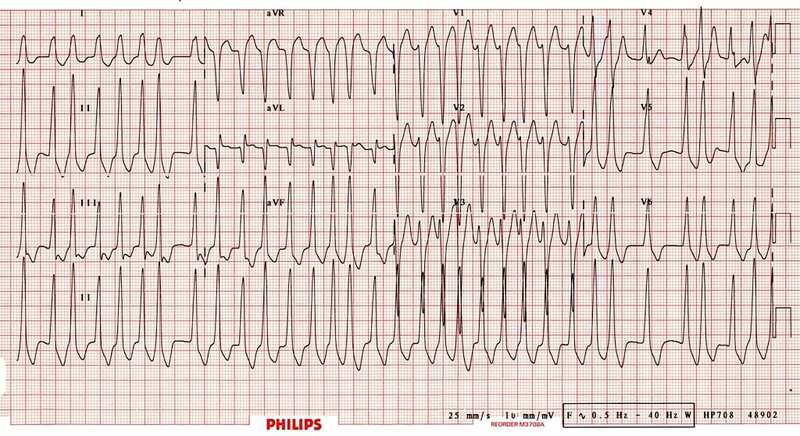 Pseudo-infarction pattern can be seen in up to 70% of patients – due to negatively deflected delta waves in the inferior / anterior leads (“pseudo-Q waves”), or as a prominent R wave in V1-3 (mimicking posterior infarction). The features of pre-excitation may be subtle, or present only intermittently. Pre-excitation may be more pronounced with increased vagal tone e.g. during Valsalva manoeuvres, or with AV blockade e.g. drug therapy. WPW may be described as type A or B. 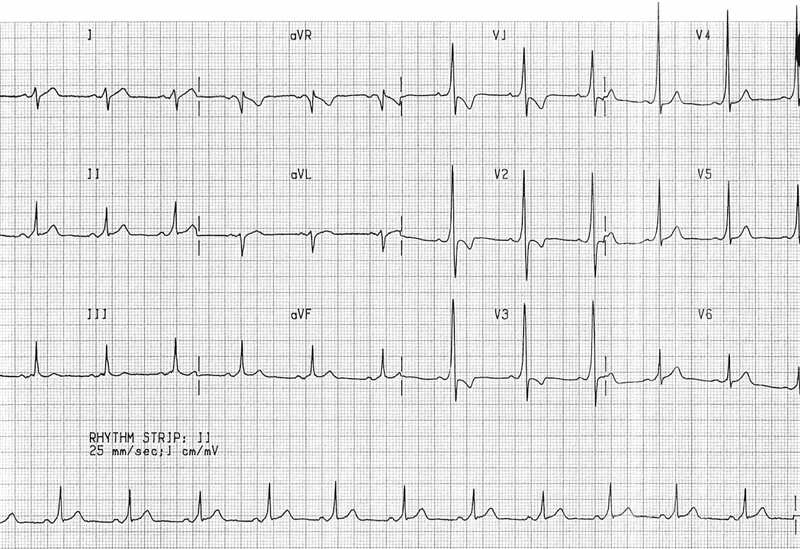 In patients with retrograde-only accessory conduction all antegrade conduction occurs via the AV node, thus no features of WPW are seen on the ECG in sinus rhythm (as no pre-excitation occurs). This is termed a “concealed pathway”. AVRT is a form of paroxysmal supraventricular tachycardia. A reentry circuit is formed by the normal conduction system and the accessory pathway resulting in circus movement. During tachyarrythmias the features of pre-excitation are lost as the accessory pathway forms part of the reentry circuit. AVRT often triggered by premature atrial or premature ventricular beats. In orthodromic AVRT anterograde conduction occurs via the AV node with retrograde conduction occurring via the accessory pathway. This can occur in patients with a concealed pathway. Treatment of AVRT is based on the presence of haemodynamic instability e.g. hypotension, altered mental state, or pulmonary oedema. In patients who are haemodynamically stable vagal manoeuvres may be successful, followed by adenosine or calcium-channel blockers, and DC cardioversion may be considered if non-repsonsive to medical therapy. 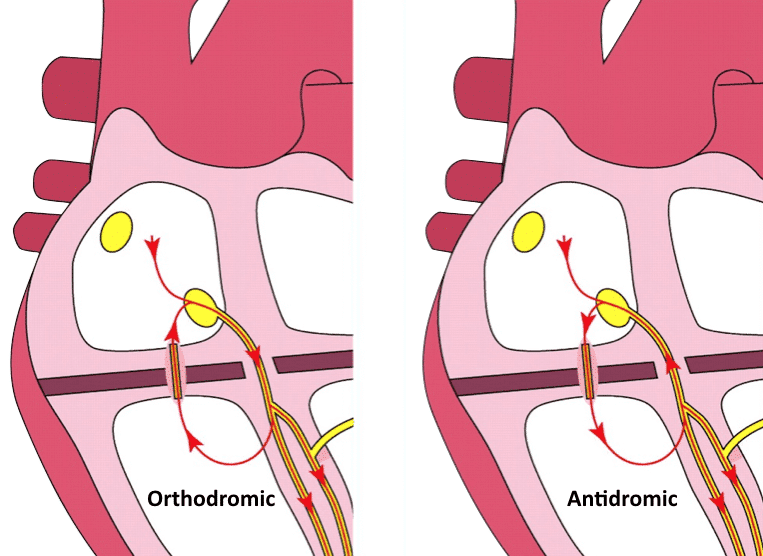 In antidromic AVRT anterograde conduction occurs via the accessory pathway with retrograde conduction via the AV node. Much less common than orthodromic AVRT occurring in ~5% of patients with WPW. 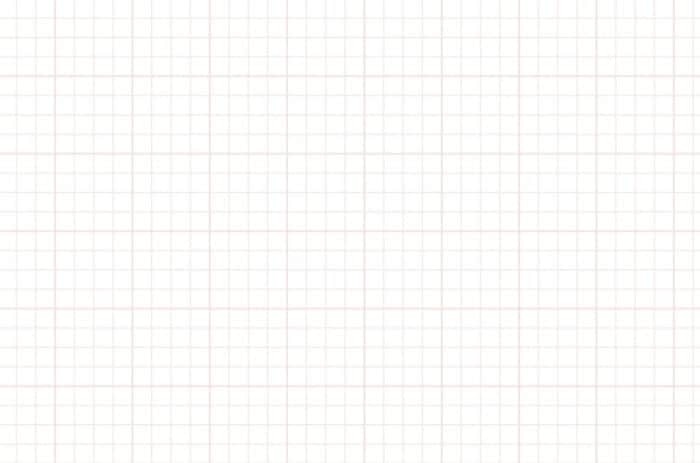 Rate usually 200 – 300 bpm. Wide QRS complexes due to abnormal ventricular depolarisation via accessory pathway. AVRT with antidromic conduction results in a wide complex tachycardia which may be mistaken for Ventricular Tachycardia. For discussion on differentiating wide complex tachycardias see here, here, and here. Atrial fibrillation can occur in up to 20% of patients with WPW. Atrial flutter can occur in up to 7% of patients with WPW. The accessory pathway allows for rapid conduction directly to the ventricles bypassing the AV node. Rapid ventricular rates may result in degeneration to VT or VF. Atrial Flutter results in the same features as AF in WPW except the rhythm is regular and may be mistaken for VT. Proposed pre-excitation syndrome. Accessory pathway composed of James fibres. Sinus rhythm with a very short PR interval (< 120 ms). Broad QRS complexes with a slurred upstroke to the QRS complex — the delta wave. 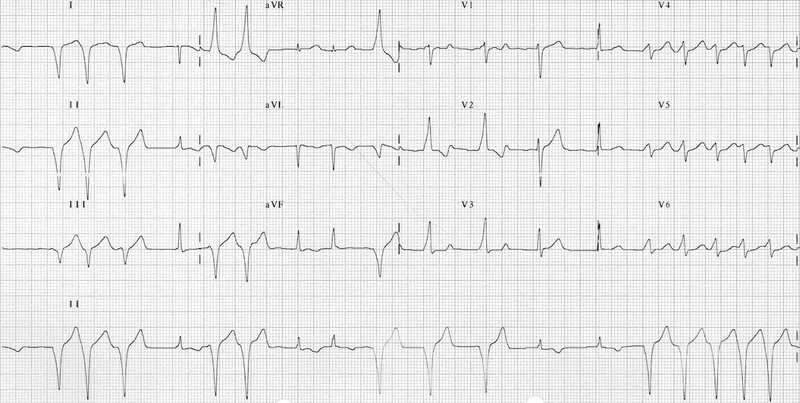 Dominant R wave in V1 — this pattern is known as “Type A” WPW and is associated with a left-sided accessory pathway. Tall R waves and inverted T waves in V1-3 mimicking right ventricular hypertrophy — these changes are due to WPW and do not indicate underlying RVH. Negative delta wave in aVL simulating the Q waves of lateral infarction — this is referred to as the “pseudo-infarction” pattern. 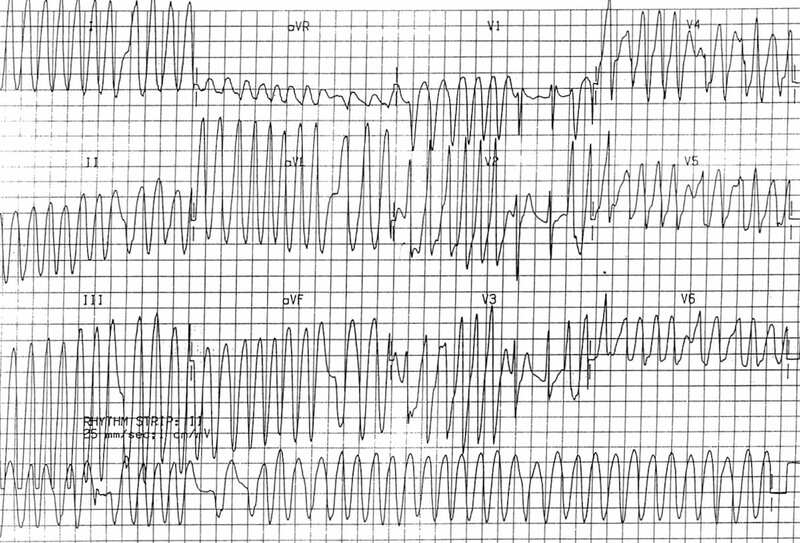 Another example of the Type A WPW pattern with dominant R wave in V1 and right precordial T-wave inversions simulating RVH. Broad QRS complexes with a slurred upstroke to the QRS complexes — the delta wave. 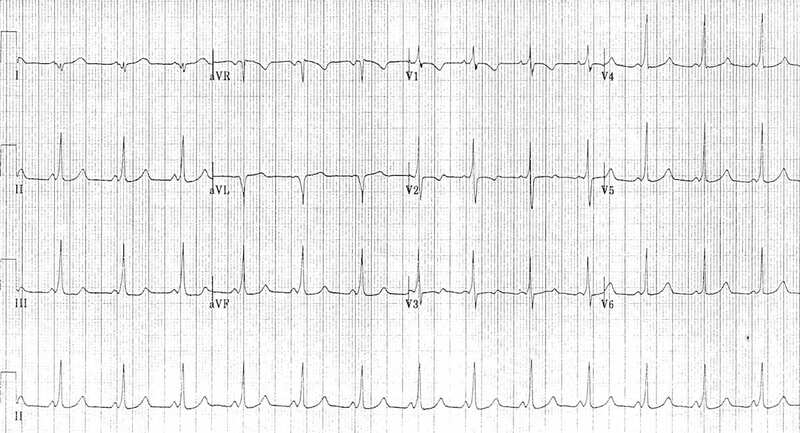 Dominant S wave in V1 — this pattern is known as “Type B” WPW and indicates a right-sided accessory pathway. 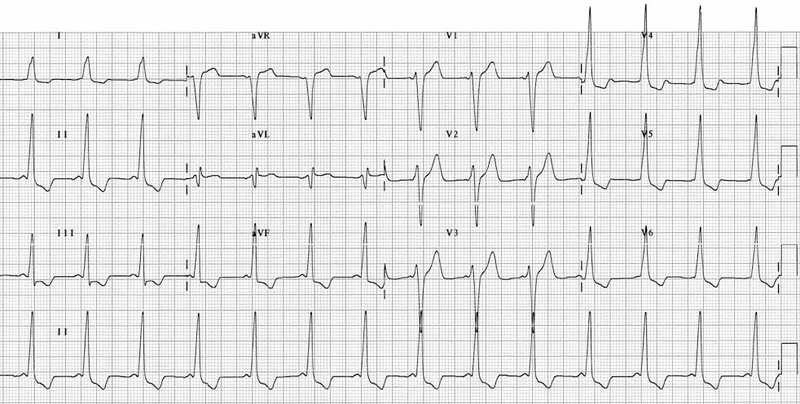 Tall R waves and inverted T waves in the inferior leads and V4-6 mimic the appearance of left ventricular hypertrophy — again, this is due to WPW and does not indicate underlying LVH. The PR interval is short even allowing for the patient’s age. The QRS complexes do not appear particularly broad — however, there is definite slurring of the upstroke of each R wave, most obvious in leads II, III, aVF and V4 (= delta waves). The RSR’ pattern with T wave inversion in V1-2 is a normal variant in children of this age; this is still a Type B pattern due to absence of a dominant R wave in V1. There are pseudo-infarction Q waves in lead aVL simulating lateral infarction. For more information on interpretation of the paediatric ECG, check out our Guide to Paediatric ECG Interpretation. Slight QRS widening and delta waves are more evident in the older child. Again, there are pseudo-infarction Q waves in aVL. 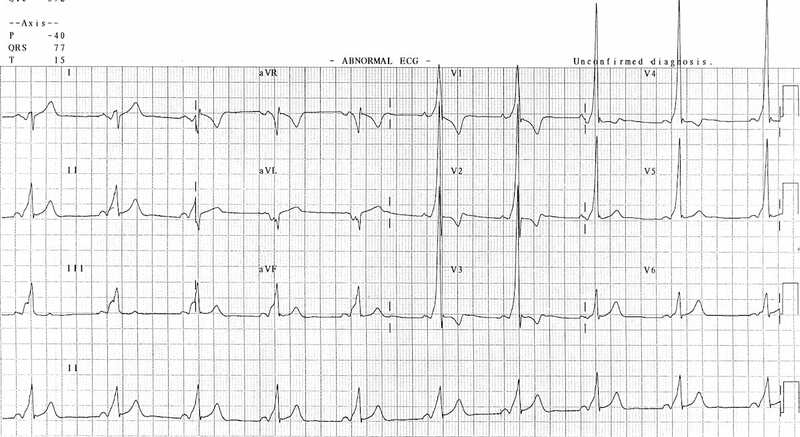 It is difficult to categorise this ECG as type A or B given that a dominant R wave in V1 is normal for the child’s age. Regular, narrow complex tachycardia at 225 bpm. The QRS complexes are narrow because impulses are being transmitted in an orthodromic direction (A -> V) via the AV node. 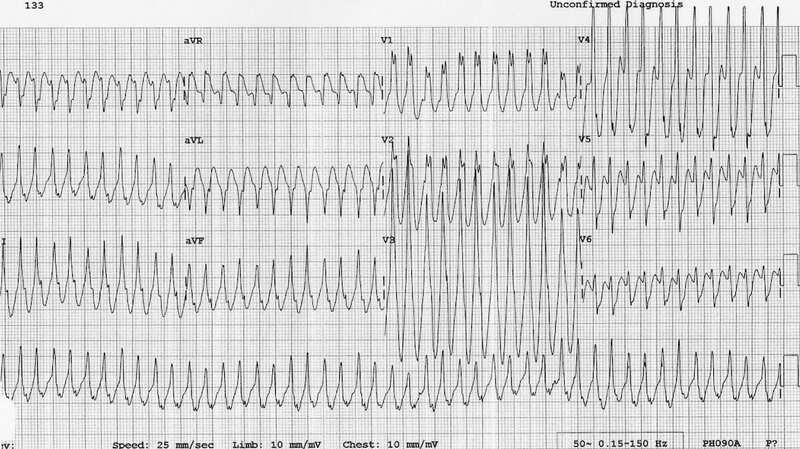 This rhythm is indistinguishable from AV-nodal re-entry tachycardia (AVNRT). 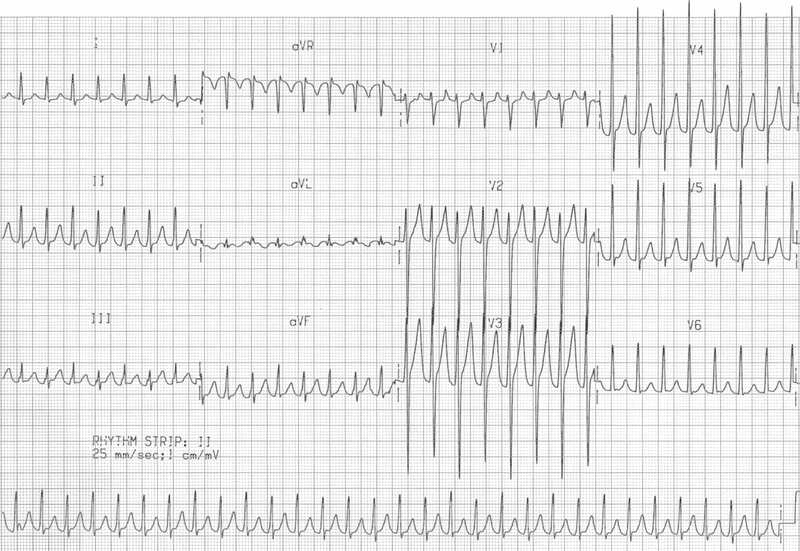 The patient reverts to sinus rhythm after treatment with adenosine. 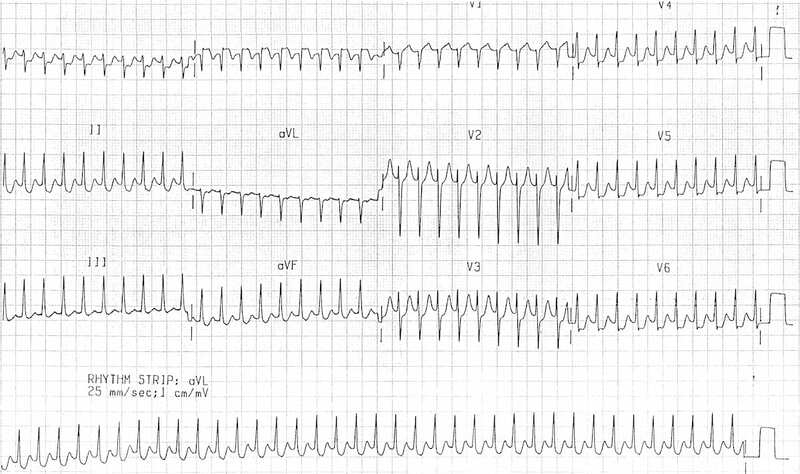 Narrow complex tachycardia at 180 bpm with no discernible P waves – this is another example of orthodromic AVRT. WPW is now evident on the baseline ECG in sinus rhythm. 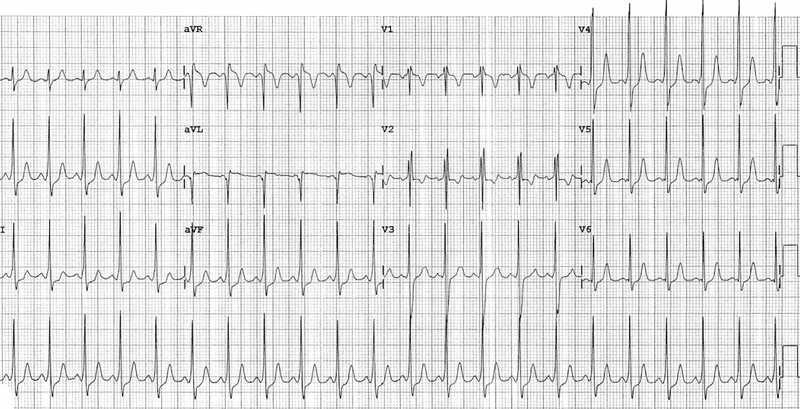 There is a regular, broad complex tachycardia at ~280 bpm; this would be very difficult to distinguish from VT. However, given the child’s age, VT is very unlikely: > 95% of broad complex tachycardias in children are actually some form of SVT with aberrancy. Read more about differentiating VT from SVT with aberrancy. The AVRT resolved with vagal manoeuvres. 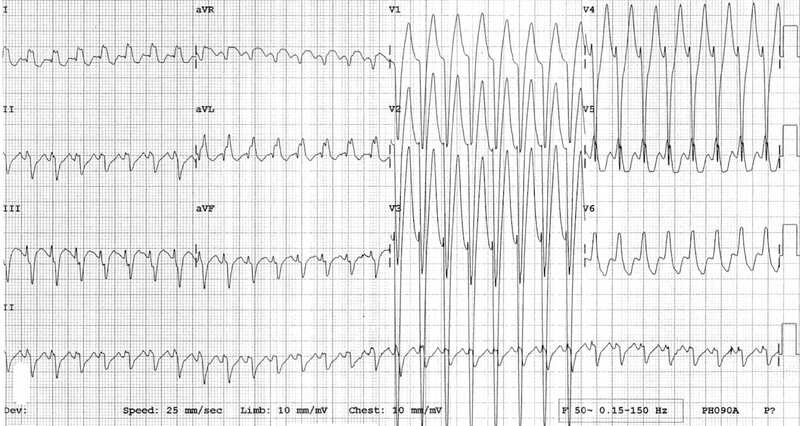 Rapid, irregular, broad complex tachycardia (overall rate ~ 200 bpm) with a LBBB morphology (dominant S wave in V1). 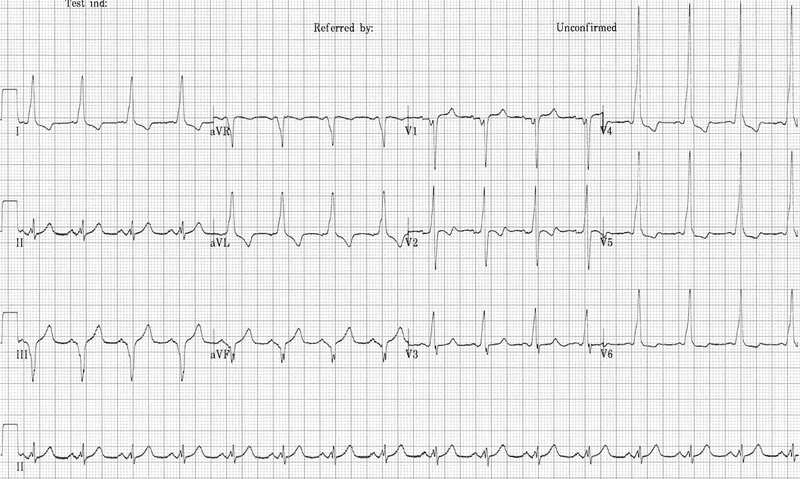 This could easily be mistaken for AF with LBBB. However, the morphology is not typical of LBBB, the rate is too rapid (up to 300 bpm in places, i.e. too rapid to be conducted via the AV node) and there is a subtle beat-to-beat variation in the QRS width which is more typical of WPW (LBBB usually has fixed width QRS complexes). Another example of AF with WPW resulting in a very rapid (up to 300 bpm in places), irregular broad-complex tachycardia with varying QRS width. There are two narrow complexes (in V1-3), where the atrial impulses are presumably conducted via the AV node instead of via the AP. This rhythm is extremely difficult to differentiate from polymorphic VT; however it does not demonstrate the twisting morphology characteristic of torsades de pointes. NB. Regardless of the aetiology, the most appropriate treatment for this rhythm (if sustained) would be immediate electrical cardioversion. Some of the impulses are transmitted via the AP (= pre-excited beats), producing characteristic delta waves. Other impulses are transmitted via the AV node, producing narrow QRS complexes. 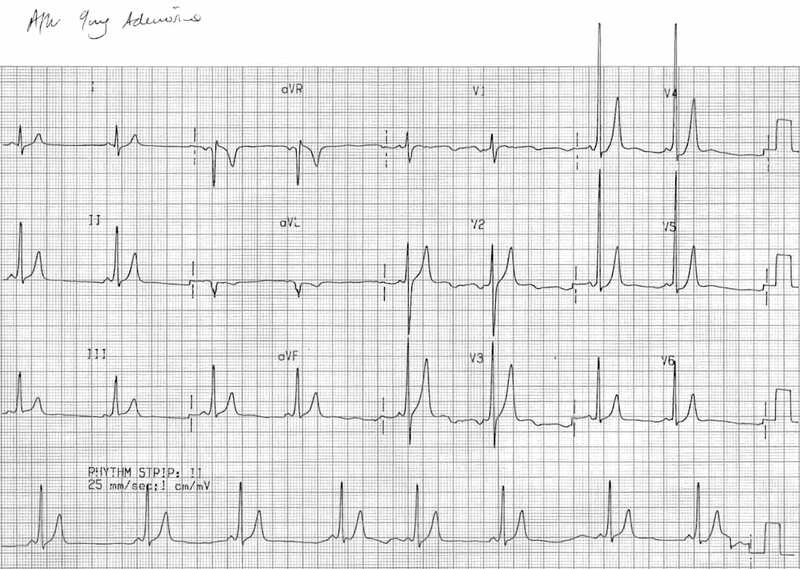 Another example of AF with WPW with intermittent pre-excitation — characteristic delta waves are best seen in V2. No evidence of delta waves.